Maybe I’m amazed. For nearly three hours, Paul McCartney beautifully serenaded 50,000 adoring fans in San Francisco on Aug. 24. The former Beatle made the sellout crowd dance and sing along to a nostalgic set of familiar favorites. “Na-na-na na, hey Jude” still echoes through the minds of lucky ticketholders. The added significance of the final event at Candlestick Park struck home when Sir Paul played his 1973 hit, “Live and Let Die.” As the band reached the chorus, fireworks illuminated the stadium. The exploding pyrotechnics previewed the impending destruction of the 54-year-old structure that’s both historic and accursed. How would the many fans wearing Giants caps and 49ers jerseys react? They delivered their loudest cheers of the night. Opened in 1960, Candlestick hosted unforgettable exploits while it housed the Giants and 49ers; Willie Mays, Juan Marichal, Joe Montana and Jerry Rice won championships and lost heartbreakers there. Richard Nixon called it one of the greatest ballparks of all time, but arctic winds quickly convinced patrons otherwise; noted attorney Melvin Belli successfully sued the city over the stadium’s faulty heating. Jerry Garcia, Tony Bennett and Pope John Paul II paid visits. So did the Beatles, playing their last concert there in 1966. 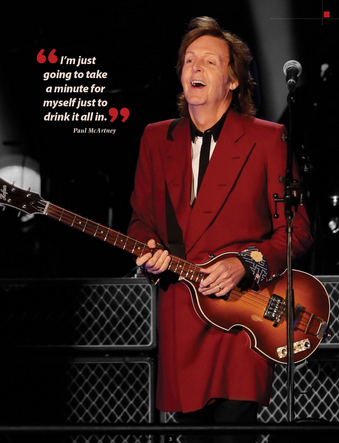 After a “long and winding road,” McCartney returned to the Stick 48 years later and reveled in “good memories,” the crowd’s adoration and the moment. That brief pause was the only break he took until the main two-hour set ended. Then the band returned for two encores. Still energetic and always charismatic more than a half-century after the British Invasion, McCartney mixed in 40 songs from his Fab Four, Wings and solo periods like “Blackbird,” “Band on the Run” and “Save Us.” The legendary musician alternated between multiple guitars, a piano and even a ukelele. For those who did and didn’t live through Beatlemania, the performance felt like an enchanting journey through time. Besides the music, the audience also enjoyed the unique stories the 72-year-old icon shared about Jimi Hendrix, Eric Clapton, George Harrison and of course John Lennon. McCartney’s touching song “Here Today” about his fellow Beatle and great friend had fans wiping tears from their eyes. Soon to meet the wrecking ball, Candlestick may not deserve “all my loving,” but 54 years of frostbite and mixed memories are over. As McCartney advised, “Let it Be.” Listen to what the man said.